Join us for the 2017 season launch at the Fitzroy Victoria Bowling & Sports Club, after Fitzroy’s final practice matches against the Monash Blues and Brunswick Renegades on 1 April. The full VAFA season starts on Saturday 8 April, but before the season gets into full swing, members and guests are invited to the launch to meet the new coaches, hear the announcement of the team captains (who will be presented with their jumpers) and learn more about the club’s sponsors and planned events for the year. 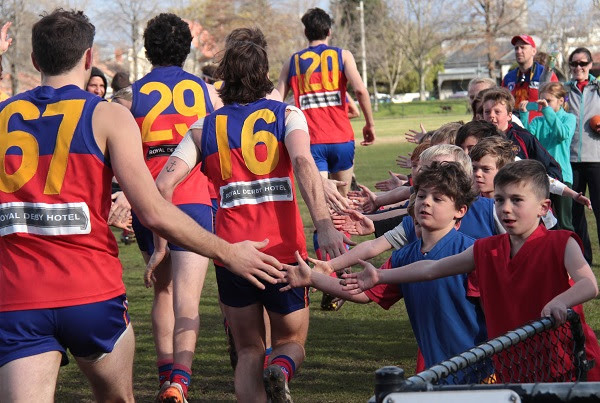 As part of the launch, those who signed up for Fitzroy memberships before the end of February will be in the draw for a new Fitzroy football jumper and the winning name will be drawn by Senior Coach, Nick Mitchell. Six of Fitzroy’s teams will be action during the day at Brunswick Street Oval and the AG Gillon Oval in Brunswick. The Bowls Club will have drinks and light meals available during proceedings until 8.30pm, so feel free to mingle and chat with your fellow Fitzroy fans. 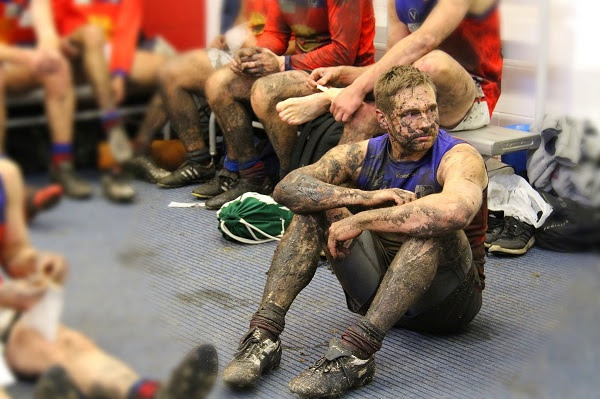 Have you ever fancied getting involved with your local footy club, but you just didn’t know how? We might focus on the players, but they wouldn’t get out there each week without a committed team of people off field who do everything from running the water, to managing the interchange, to ensuring the crowd knows the correct score. Not everyone can kick a drop punt, but perhaps your strengths lie in detailed work like keeping the stats. Maybe you are keen to keep fit over winter and could take on a role as a boundary umpire or runner. Then again, perhaps you’ve always secretly wanted to wave the goal flags. We’re very keen to identify some volunteers for the game-day stats roles, so they can have a trial run during the practice matches. Please contact Sharon Torney as soon as possible if you have strong footy knowledge and good, fast data entry skills and you’re interested in being involved. 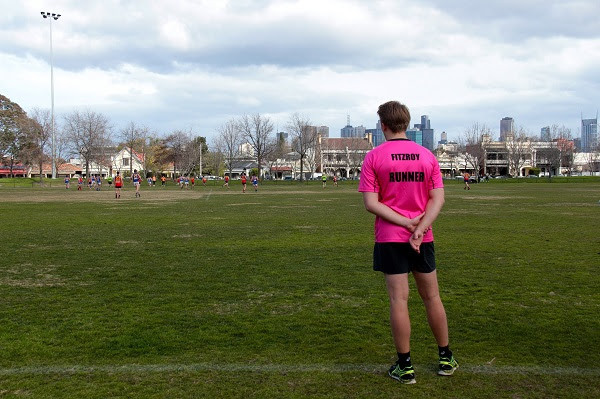 With seven teams playing in the VAFA this year, Fitzroy is putting the call out for a wide range of on and off-field volunteer activities and we want you! Some of the roles are for every week, whilst others only require a commitment for home games. Take a look at the volunteer role descriptions and see if it might be for you. Postie by week day, Dave Barnes dons the white jacket and flags on a Saturday afternoon and makes sure we all know when the Fitzroy Ressies have scored a goal. 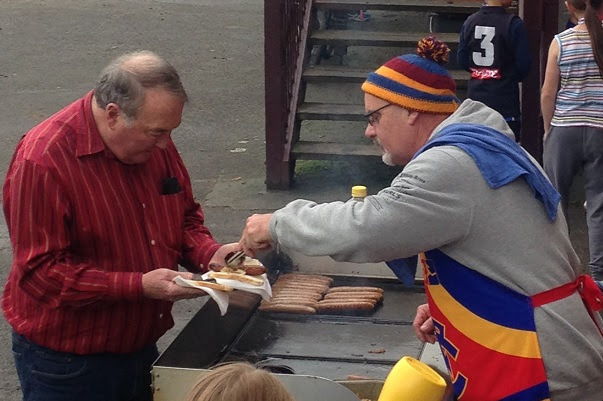 Then he takes up the tongs to help out with the famous Fitzroy BBQ. “I got involved because I was a Fitzroy supporter from birth. Dad barracked for them. I watched a couple of games in 2011 and then started going every week in 2012. “I turned up to watch the seconds one day and Sharon asked me if I could goal umpire; been doing it ever since. I love doing it and anything else I can to help out,” Dave said. Fitzroy also has a raft of other club volunteer roles which include communication and social media updates, event organisation, merchandise sales, bar work and more. We have a quick online form so you can register your details and area of interest and the club will be in touch. Go on, you know you want to get involved! The surge of love for women’s football has prompted unprecedented demand for spots in Fitzroy’s women’s squad. 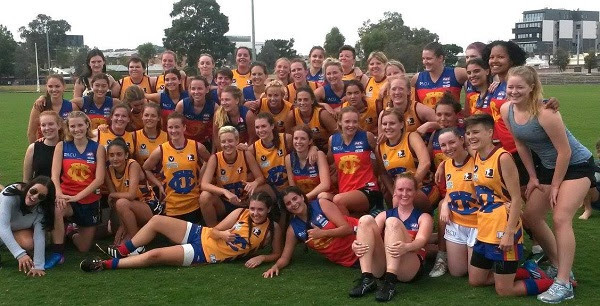 At this stage we have over 70 players training and indicating an interest in playing for the two Fitzroy-ACU teams, which will play in the inaugural VAFA women’s competition this year. Unfortunately we’ve had to stop accepting new players onto the list, as we need to make sure players get the opportunity for some quality game time during the season. The club will assess the demand during the year and consider how it approaches the timing of a call for new players for season 2018 and whether there is a need for an additional team. Thank you very much for your ongoing interest in our women’s footy teams. Go Roy Girls! 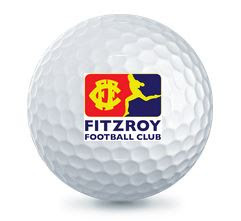 The annual Fitzroy Football Club Golf Day will take place on Sunday April 2 from 1pm. This year golfers will be treated to Growling Frog Golf Course, located 50 minutes north of the CBD. The format will be a two-ball Ambrose event (play in teams of two, but groups of four). This is a fantastic opportunity to enjoy a round of golf with current and past players, members and supporters ahead of the start of the VAFA season. A presentation ceremony and refreshments at the clubhouse will follow the round. To book, email your name along with details of your playing partner to corbinstevic@gmail.com. The first five pairs to sign up will receive a FFC branded golf ball! The $60 entrance fee will be payable on the day and will include your 18 hole green fee and use of an electric cart. Saturday 1 April – Fitzroy vs Monash Blues (5 teams in action) at Brunswick Street Oval; Women 1 v Brunswick Renegades, Alec Gillon Oval. The Women’s squad will also be playing practice matches. Fitzroy-ACU Women’s 2 will be in action against West Preston (Northern Football League) this coming Saturday starting at 4.15pm at CH Sullivan Memorial Park, Reservoir. Fitzroy Club Life Member, Brett Pollard, is West Preston’s inaugural women’s coach. The women’s teams will also play a practice match on the weekend of 25 March, with details to be confirmed. A big thank you to Corbin Stevic, Emilie Goegan and Tess Cosgrave, who represented the senior men’s and women’s teams at the VAFA media day recently. We understand there is plenty of interesting video footage which will be released over the course of the season, so keep a close eye on VAFA’s Facebook and Instagram posts, although we will be sure to share it on our pages too. Did somebody say lip sync battle? Who knows what the VAFA has in store, but expect to see some serious and some funny material. Did you know we’re on Instagram? We haven’t been the best at sharing our images, but we’ll be beefing up our efforts in 2017, so if you’re on Instagram, follow us and make sure you tag us in any of your Fitzroy-related photos.